MIO activities from the last few days have included some more music choosing. Though the blurb for the concert says I'll be playing archlute and theorbo on this show I was reading about a manuscript of guitar music that appears to have been written for the Holy Roman Emperor Leopold I himself. 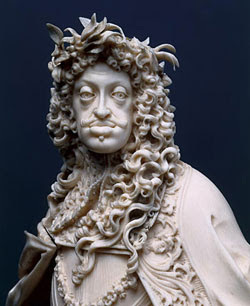 This handsome guy is pictured here in a sculpture by a Matthias Steinl in the last years of the 17th century. I don't think the Habsburg chin is helped very much by the soul patch style beard. Or is it a mole? Anyway, despite, or maybe because of the lack of genetic variety in Leo's family tree, he was a pretty talented musician. The music in the manuscript is probably by Orazio Clementi, who was theorbo player at the Imperial court. When Clementi was getting on in years they hired Francesco Conti to help out with the duties. As noted in a post below, his music is hard to find, despite him being a 'very important historical figure'®. There is a cantata by him in a manuscript in the Bodleian Library in Oxford. The music manuscripts from the Bodleian are all available on microfilm so I got them to dig the right one out of the boxes in the back of the Faculty of Music library at UofT and printed it out. So we will (perhaps) be giving this Conti cantata its North American premiere on New Year's Day.